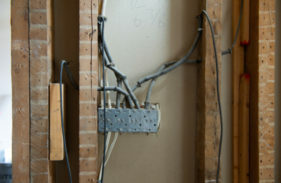 Of all the services plumbers offer, sewer repair is probably the least understood. 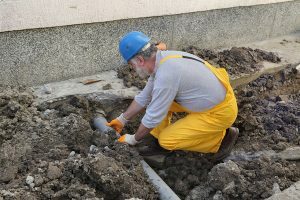 If you’re having pervasive plumbing issues, your sewer main line may be the root of the problem. Here are our expert’s answers to frequently asked questions about sewer repair, and why you might need it. There are two ways to fix a broken sewer line: traditional sewer repair and trenchless sewer repair. During traditional sewer repair, experts use a backhoe to dig a trench they use to access your main sewer line. Technicians locate the sewer line problem at the source and take appropriate and effective action to fix it. Traditional sewer repair is required if large segments of the sewer line need to be replaced entirely. It’s very effective, but your yard will have to be partially dug up. Luckily, traditional sewer repair isn’t always necessary when there’s a problem with the sewer line. Trenchless sewer repair doesn’t require any digging at all! Instead, the expert inserts a special, small camera into the sewer line to inspect the inner walls of the pipe. This means no digging up yards, cracked driveways or ruined parking lots. Using live cam footage provided by the camera, the technician identifies the problem in the sewer line. Once the problem is identified, the plumber knows how to fix it. If the line is blocked by debris or tree roots, we use a hydro jetter to clear it out. If the pipe is ruptured, we can re-line it with a resin substance called “cured in place pipe,” or CIPP. CIPP can be inserted directly into the old pipe, where it will cure and harden, forming a new, unbroken pipe. If the whole length of piping needs to be replaced, we can use a process called “pipe bursting” to pull a new pipe through the old one. As the new pipe enters the old pipe, the old pipe “bursts” to make room for the new one. Trenchless sewer repair is faster, less invasive, and usually cheaper than traditional sewer repair, but it may not be feasible in all circumstances. 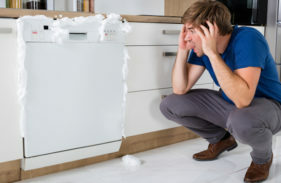 How Do Sewer Lines Become Damaged? Your main sewer line runs under the ground beneath your house and yard, but several things could still damage it. 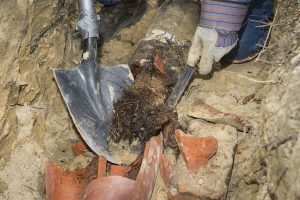 Tree Roots: The most common source of sewer line damage. 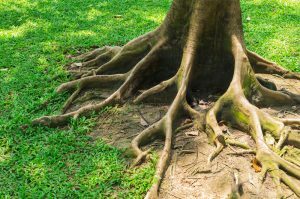 As the trees in your yard grow, their root systems push further into the ground. Roots can grow with enough force to punch through pipe walls, causing a rupture and blocking flow. Sediment Buildup: Over time, minerals and other debris in your water may collect on pipe walls, including the walls of the sewer main line. If enough sediment builds on the sewer lines walls, it may block water flow.  If the block is bad enough, pressure may build in the pipe until it ruptures. Rust: Most sewer lines are made of metal, which means they will rust or corrode over a long enough period of time. Rusted pipes may crack or rupture. This is particularly likely if your home is old or your pipes are made of substandard material. High Pressure: If your home’s water is over pressurized, it may put your sewer line under more strain than it can handle. Over pressurized water may also wear down inner pipe walls. Ground Shifting: If the ground around or under the sewer line shifts, the pipe may detach, bend, or break off. Earthquakes may shake up the ground enough to do this, but other natural disasters or nearby major construction may also be responsible. you should consider having us out to at least perform a thorough inspection. because there’s a blockage in the main sewer line preventing that sewage from flowing out of your home. Drain Blockage: If you tend to experience drain blockages frequently, or if several or all of your drains clog simultaneously, it may be because of a blockage or clog in the main sewer line. Sewer Gas Smell: Damage to the sewer line may cause raw sewage to leak or seep out, flow back upwards through your home’s pipes, or sit stagnant inside your pipes. You may be able to smell the foul-smelling gases generated by this sewage in or around your house. Slow Draining: When build-up or clogs accumulate on your sewer line’s walls, sewage may have a hard time travelling through it at a normal speed. Slowdown in the sewer line below will eventually slow down your drains, too. Wet or Soft Spots in Yard: When sewer lines leak, they expel sewage water out into the ground around them. 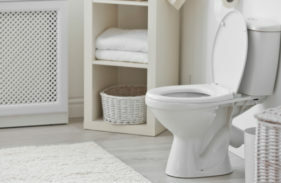 This sewage can permeate the ground and rise, eventually softening the yard or even flooding it. How Do I Get Sewer Repair? Call or schedule a consultation with a Mike Diamond professional online today. We’ll be able to help you figure out what’s wrong with your sewer and solve the problem in the most efficient, cost-effective, and permanent way possible. 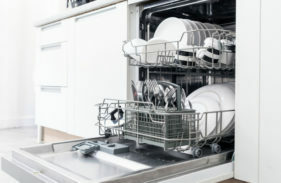 Not matter how severe or minor the problem, our expert technicians are more than ready to tackle it and come up smelling good.